Fyrelane USA provides an American manufactured storz adapter for the fire industry. Our storz are designed from a durable forged aluminum alloy which is pressed on a military grade press to deliver a smooth flow of metal during the forging manufacturing process. During our machining process we use precision manufacturing techniques to provide consistency in our specifications. 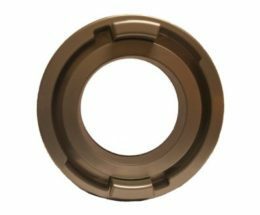 Our open bore storz adapters are designed with quality materials which are the same as our Hydra-Storz adapters using 6061 Aluminum Alloy heat treated to a T-6 giving the storz an exceptional performance during operation. The coating we currently utilize on our storz adapters is a premium engineered industrial silver colored powder coating to help lessen the corrosion growth from harsh environments. Our Storz Adapters are within the NFPA 1963 Standards and Tolerances for Fire Hose Connections.